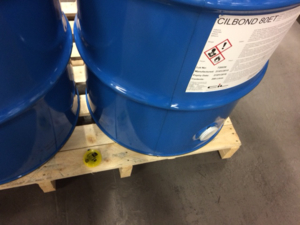 Analysis of recorded data provides evidence about the heat cycle sensitive chemicals are exposed to during shipment by sea, to help ensure the correct temperature conditions are maintained in transit. Chemical Innovations Limited is a manufacturer of high-performance primers and bonding agents for the rubber, polyurethane and friction industries. Exports count for 80% of the company's output, with many orders being sent by 'Deep Sea' shipment. Products are solvent-based liquids, and CIL's Mexican customer, who uses the chemicals to make automotive suspension parts, has requested that information be provided about temperature variation during transit from the UK to Mexico. Shipments are sent to Mexico approximately every six weeks, with a transit time of 3-4 weeks. Tinytag Transit 2 temperature loggers are used to record the data which is downloaded by the Mexican distributor upon receipt, for submission to the customer together with the bonding agents. Using the Tinytags enables CIL to gain a better picture of conditions experienced during the journey their products take before reaching the Distributor. Marcus Hunter is the Commercial Manager at Chemical Innovations Limited. "I chose the Tinytags as they are durable, a good price and manufactured by a UK company. When I first called a couple of years ago I found their help desk very professional. Using the loggers adds value to our customer's experience and takes away any doubts over the heat-cycle of the products during their journey by Sea from the UK. And the new inductive pad is very handy!"